Eight towers along Melbourne's Southbank shoot the world's largest fireballs into the night's sky, with jaw-dropping spectacle. An experience not to be missed, Crown Melbourne's Gas Brigade evening shows happen at every hour, on the hour at night. The firing of the Gas Brigade is subject to prevailing weather conditions and do not fire on days of 'Total Fire Ban' for the Central Region as declared by the CFA. This image belongs to the travel and nature stock photo library. This stock photo of Crown Melbourne's Gas Brigade Fireballs Show is available for licensing for commercial and editorial uses including websites, blogs, books, magazines, brochures and advertising. Restrictions may apply for images which contain third party copyrighted material or sensitive subjects. Photos of artwork are for editorial use only. 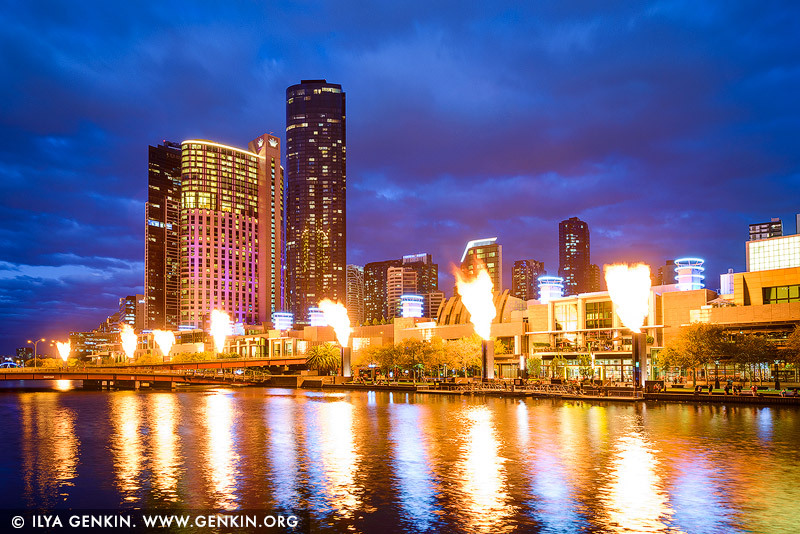 This image id AU-MELBOURNE-0024 of Crown Melbourne's Gas Brigade Fireballs Show, is copyrighted © by Ilya Genkin. This is not a public domain image.